Happy 2018! This year we’ve already quietly launched a couple of features that you’ve been asking for. 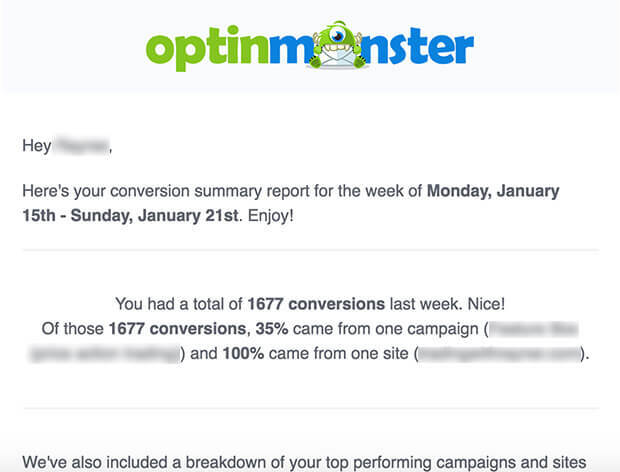 Yes, we’re talking about those new weekly conversion summary emails… plus a brand-new native integration. We know you’re busy – running a successful blog or business takes up a LOT of time. When you’re that busy, it’s easy to forget to check your conversion analytics… but this can often lead to missed opportunities. What if your top campaign suddenly stops converting, or you get a sudden spike in conversions on one site? When something like that happens, it’s important to act right away. The email summaries include your total conversions, best campaign, and more stats, plus links to our favorite resources to help you boost your conversion rates. At OptinMonster, we integrate with all the most popular email marketing service providers and we’re always adding more. Our goal is to make it as easy as possible to grow your list fast, no matter what service you use. That’s why we offer dozens of native integrations, plus custom HTML forms and a powerful webhook that uses Zapier to connect with hundreds more apps. The latest integration we’ve just added is with EmailOctopus, an affordable and user-friendly email marketing service provider that runs on Amazon’s reliable Simple Email Service (SES). For step-by-step instructions, check out our documentation on how to connect OptinMonster with EmailOctopus. Instead of relying on Google Analytics, we’ve created our own built-in analytics solution. This will allow us to offer better tracking features for you, like the conversion summaries featured above. The next goal is to use the data that we have to offer better reporting, so you can further improve your conversions. Our pre-built themes are designed to be high converting right out of the box. But we know sometimes you want to be able to have more control over the details of your campaign design. With our upcoming drag & drop builder, you’ll be able to create completely custom campaigns by simply dragging & dropping elements in the order you like. It’ll be extremely easy to customize the look and feel without any CSS or HTML knowledge. OptinMonster’s display rules are one of our biggest strengths. With all our campaign targeting and trigger features, you can create smart marketing campaigns that are customized for each visitor. We’re hard at work on optimizing those display rules, so you can speed up your workflow by at least 3x for more complicated rules, while reducing any potential conflicts. That’s all for this week! To be notified when these features are released, be sure to subscribe to our newsletter to be the first to know, and follow us on Twitter and Facebook to get updates. 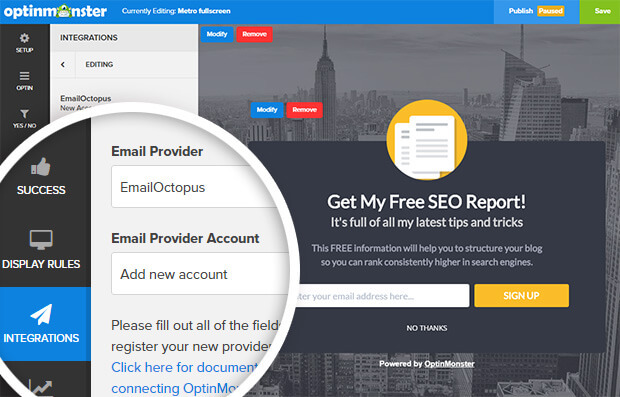 If you want to grow your list FAST whether you’re using EmailOctopus or any other email service provider, click here to get started with OptinMonster today!